As an Event Marketer, the key of your event marketing strategy is to know your audience. Detailed insights into your fans’ purchasing behaviour allows you to understand which marketing campaigns work best with which audience. In addition, it is also possible to learn valuable insights to increase ticket sales. We are excited to introduce you to Timelines. This tool will help you implement the most efficient marketing strategies . It is the latest in a suite of reporting tools. 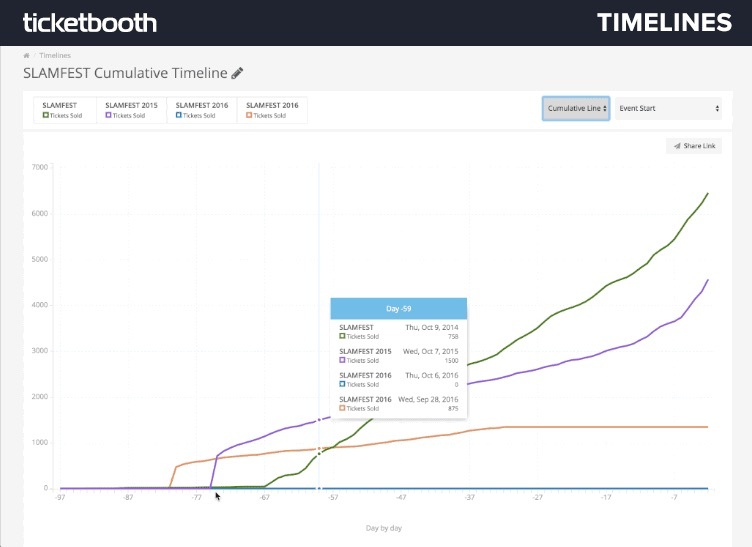 We designed Timelines to make analytics an integral component of your daily workflow. Previous tools have emphasised real-time analytics. But, Timelines gives you the power to create clear visualisations of historical ticketing data. Compare clear visualisations of YOY sales data to detect trends in ticket sales. As a result, you will be able to answer questions about customer behaviour. Learn more about the best time to start selling tickets. Plus, you will get a better understanding of the growth of your event. Simultaneously compare sales for multiple events. Several timelines can aligned to specific points in the event lifecycle. It allows you to detect trends in ticket revenue, tickets sold, completed orders, and many other datasets. Optimise your event’s marketing and keep costs low. For instance by tracking which of your marketing campaigns give you a better return on your investment. Compare how your ticket sales fluctuated from the beginning of your campaign to the end. You will learn which campaigns contribute the most to your bottom line. 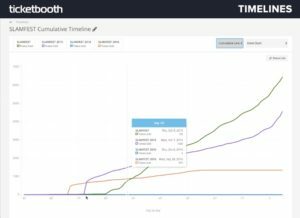 After the analysis has been done, easily share Timelines’ visuals with your event’s stakeholders. Show them how your event has grown over the years. Besides, you can show which event sells the most tickets and marketing trends. The Timelines feature is now available. For any question or further information, do not hesitate to contact us. We are always available to help you. In addition, to learn more on event marketing and event management, visit our blog here. Glastonbury, Tomorrowland, Sziget & More: How Top European Music Festivals Use Social MediaAre You Ready For The Next Generation Of Event Marketing?